One of the most challenging things in branding is ensuring the consistent delivery of your brand promise across all touch points. This is true in product and corporate branding, and especially true in place branding where a community’s citizenry can play such an important role in your communication mix. A tool I have found to be extremely helpful is message mapping. It is a process I have used successfully for over 30-years to help ensure everybody involved in helping deliver the promise of a brand understands what the message is and how to articulate it. Like most tools that are effective, message mapping is deceptively simple in concept but can be challenging in execution. In my experience, the biggest challenge is in reaching a consensus on content and ensuring utilization. The message map is a tool to organize the main communication points underpinning a community’s brand promise. It is expected the user of the message map will translate the main points into benefits and language for the specific target audience and media being used. Think of it as a guide to communication. There are several ways to visually depict a message map. This is a picture of the format I prefer and use. 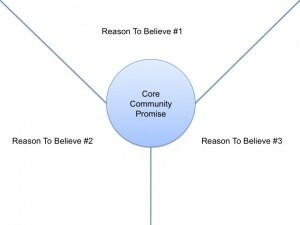 At the center of the message map is your community promise. This is the key benefit positioning statement you are investing in establishing as your community’s sustainable equity. It describes how you want your community to be thought of. An effective promise is relevant, competitive and authentic. A message map is not a tool to help you define your community’s promise, it is a tool to help you communicate it after you’ve developed it. You can read more about how to create a promise by clicking HERE. 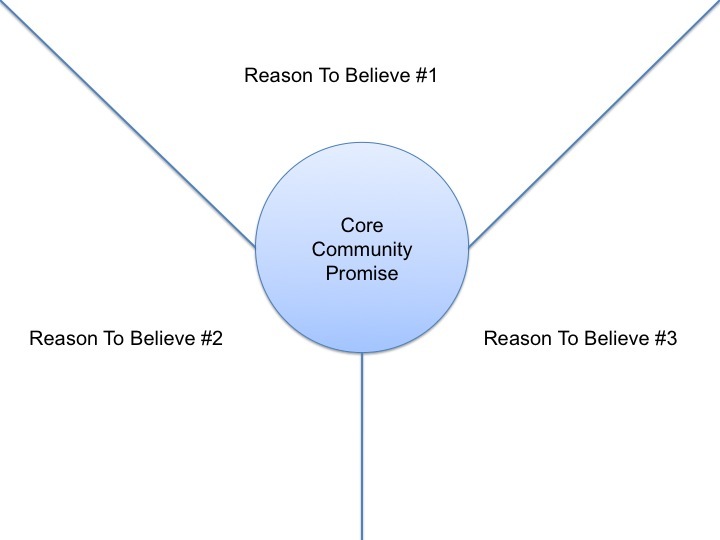 Reasons to believe (RTBs) are the most compelling claims you can make to support your core community promise is authentic. Think of them as proof points. I like to limit the number to three in order to force prioritization of the many reasons you and your community leaders might be able to brainstorm. Your community promise and the three RTBs should be informed by insights you have gleaned into what your target audience believes is most important to the decision you are asking them to make (e.g. select your community over another location for capital investment). Ideally you will be able to support the insights with quantitative market research findings rather than anecdotal information. It is important to note that the message map makes choices on what NOT to say as well as what to say. That is why alignment of community leaders is often the most challenging part of the process. There is not room for everybody’s opinion to be reflected. An analogy would be letting everybody in an orchestra play their favorite musical piece. Each might execute well, but you would have nothing but noise. You need a conductor that ensures each musician plays from the same sheet of music to turn noise into a sonata. While it is critical to have a core message and RTBs, it is also appropriate to translate the top-level message map into a cascaded map that can be used to communicate with specific prime prospect targets within your strategic target. Often this will look like a different set of RTBs that are even more compelling and relevant to the prime prospect target. For example, suppose your community promise was easiest access to the majority of profitable markets in North America. One prime prospect target you might pursue is companies in the manufacturing industry. Certainly a relevant RTB for such a promise would be the quality of your transportation infrastructure (road, rail, water, air). However, if you are also pursuing software design companies as a prime prospect target, the bandwidth and speed of the internet infrastructure in your community would be a more relevant RTB. Key to cascading the message map is to be able to easily demonstrate how the articulated promise in the circles are a restatement of the top-level promise into the language of the prime prospect target. Often this step is overlooked or not well understood. The linkage between the community’s marketing messaging and sales messaging is lost as a consequence creating unproductive confusion. Once the message maps are created, they are best deployed as a set along with some training on their proper use. It is important people see the message map as providing guidance and understand that in every opportunity the core promise should be communicated and supported by as many of the three RTBs as practical. It is not necessary to provide every RTB every time. It may not even be possible depending on the communication media you are using. The choice of which RTBs to include is situation specific. To make deployment even more effective, specific examples can be added to the RTBs that help bring them to life. Building a library of as many examples as possible is a great way to make the use of a message map easier. You will need to be certain the companies in your community you decide to use as examples of the promise being realized are aligned with you telling their story. Take the time to get alignment to your core community promise. Recognize that there are a long list of RTBs you could have used, but the three you selected are the ones you will preferentially emphasize in communication for consistency. Leverage data and insight from your target audience as much as possible. Recognize the RTBs for a company staying and the RTBs for a company selecting your community for the first time may be different. View these as two unique prime prospect targets and cascade your message map accordingly. If you find your community promise doesn’t cascade well, revisit the promise. 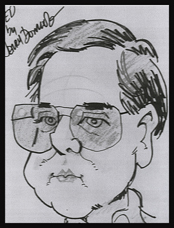 Be certain as you cascade the top-level promise that the restatement has not changed the meaning. It is important that people in the process understand that trying to communicate all the reasons why your community is great simply creates noise and results in a confusing message. People in the process need to see examples of how to use the message map properly. Monitor application of the message map to ensure it is actually used and not simply an exercise that gets put on the shelf. Have you had experience using the message map process to ensure consistency in communication? Or, have you used a different process that works? Please take a few moments to share your experience.